On May 8th, at The Annual Nassau County Auxiliary Police Awards Ceremony, five of our Volunteer Auxiliary Police Officers received Service Awards for 2017. For over 300 hours of service: Sergeants Derrick Nankoo and Rajinder Gujral. For over 500 hours of service: Auxiliary Police Officer Linda Halas-Kaplan, Auxiliary Police Officer First Class Jonathan Levy, and Auxiliary Captain John Concannon. Promotion: Captain John Concannon to Deputy Inspector. Congratulations to our New Hyde Park Unit 212 Auxiliary Police Officers and their families for their commitment to the Nassau County community. The Village of New Hyde Park is looking for community minded residents to volunteer as Nassau County Auxiliary Police Officers. As an officer, you would assist the N.C.P.D. patrol the county; assist at parades, community events, countywide events and large-scale emergencies. The Nassau County Auxiliary Police is looking for concerned residents between the ages of eighteen and sixty to assist the Nassau County Police Department in protecting our communities. Nassau Residents must meet the following qualifications to become a member of the department. 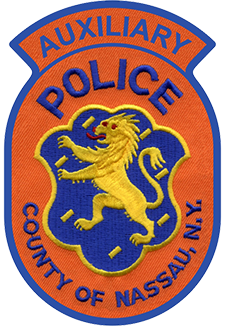 As an officer, you would assist the Nassau County Police Department patrol the county; assist at parades, community events, countywide events and large-scale emergencies.